This week on DC Music Rocks, Jazs, Linwood Taylor, and Willie Leeble from various blues festivals and organizations around DC, stop by for a chat with host Brian Nelson-Palmer. The episode also features great tracks by Jonny Grave, Memphis Gold, Sol Roots, Lori Williams, and Patty Reese. Podcast: iTunes, Google Play, Stitcher, TuneIn, Pocket Casts, PodBean, PlayerFM, or THIS URL in your other podcast app of choice. Tell Siri, Alexa, or Google Home "Play the podcast DC Music Rocks"! The DC Blues Society is a non-profit 501(c)(3) organization Celebrating the Blues since 1987 in the Nation's Capital - MD, DC, VA through outreach and education. 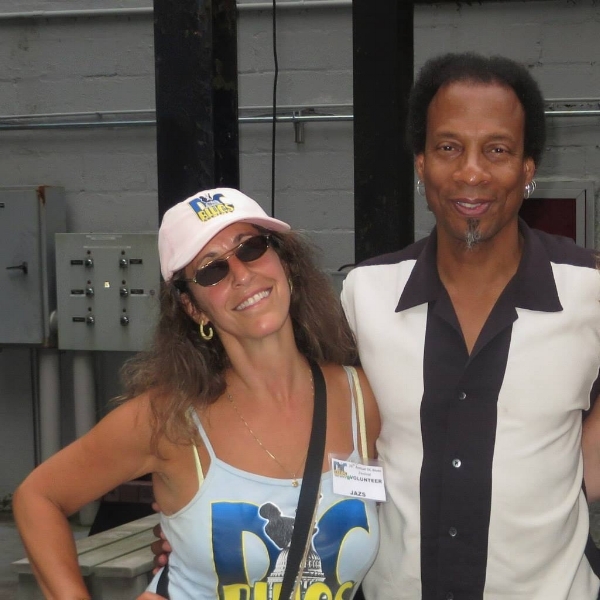 Jazs, a member of the DC Blues Society (DCBS) and promoter of the Blues since 2004. Co-Founder of the Silver Spring Blues Festival celebrating its 10th year. Representing the Greenbelt Free Blues Festival held September 22 and the November 10 College Park Free Blues Festival, an IBC Fundraiser to send the DCBS Battle of the Band winners to the ‘American Idol of the Blues’ in Memphis, TN. Visit the DC Blues Society Booth at both events. Washington, DC, Bluesman Linwood Lee Taylor has led his own band for more than a decade. Winner of 3 WAMMIES for “Best Blues Band”, the band appeals to a broad audience and has opened for Rock & Roll Hall of Fame Diva Etta James, and the Legendary Johnny Winter. Linwood has traveled around the world with Joe Louis Walker and can be seen jamming the Blues at Winchester Church Blues Mondays and around the DMV and at GBF on 9/22/18. Willie Leeble represents Archie Edwards Blues Heritage Foundation, oversees AEBF Weekly Jams and has produced and MCd the Silver Spring Blues Festival Acoustic Stage and College Park Blues Festival 10th Anniversary events. AEBF is sponsoring the Greenbelt Blues Festival Ukelelee / Harmonica / Guitar Workshops and is getting ready to celebrate the 20th Archie Edwards Blues Heritage Foundation Anniversary! The Archie Edwards Blues Heritage Foundation was created to preserve Archie Edwards memory and to carry on the work he began at his barbershop in Northeast Washington, DC, to teach people about Piedmont blues and keep the tradition alive. For those who don't already conveniently get all this via email! Here’s just a few highlights for the coming week, be sure to check out the calendar for the full list of all the upcoming shows! Do you like what we're doing? Would you support us? We'd love to grow and do more! We're giving away shirts, access to our private facebook group, and more! We also intend to set aside 10% to contribute directly in the DC Local Music Scene through charities, sponsorships, events, etc. We want to continue to pay it forward! HUGE shoutout to our current Patrons! We're looking for local businesses to spread the word about with our more than 12,000 followers. Know One? Would you introduce us to them? We're up to 12 hours of music on the show's Spotify playlist, follow it to be able to easily find these great tracks! Jonny Grave is a guitarist, songwriter, singer, bandleader, teacher, musical historian, journalist, photographer, and Bluesman from Washington DC. Growing up in a very musical family, Gravewas introduced to the sounds of American traditional folk music early on. At age fifteen he found himself learning slide guitar techniques from old Blues records, and by seventeen he was performing them live. Brian: Jonny Grave is a guitarist, songwriter, singer, band leader, teacher, musical historian, journalist, photographer, and a bluesman, from Washington DC. He's grown up in a very musical family and he was introduced to the sounds of American traditional folk music early on in his life. At age 15 he found himself learning slide guitar techniques from old blues records, that the musical family that he was in had around the house and by 17, he was performing them live. The first time I ever saw Jonny he was on stage with The Tombstones and I had seen him perform three or four times before I actually got to meet the man, and good gracious, between the slide guitar and the energy, and the jumping around. If you haven't been to a Jonny Grave show, you are in for a treat when you see this man. Check him out on YouTube if you're not in the area to see it. I should stop talking so that I can introduce you to the guest of the day and my special guest. I'm excited. It's great. It is with great pleasure that I introduce you to Jonny Grave. Say hi Jonny. Jonny Grave: Hi. How are you? Brian: One more time, you've said hi three times now. Thanks for that. Now tell us more than hi. Tell us about you. Tell us about Jonny Grave the artist, the quick background. Jonny Grave: I'm a hack. Jonny Grave: No, I play blues and because that's a remarkably old style of music. It goes back several decades in this country, there's a lot of source material to draw from. Even those tunes that are only 75, 80 years old, those go back to older, and older, and older tunes so there's a lot to draw from. I've kind of got my work cut out for me, really. It's less a matter of working hard. It's a matter of collecting songs. Brian: Got it. Now, tell us about you outside of the music. Well first of all, before we do that. I ran through this whole list of all the things that you do. Run me through some of that stuff here. Share with the listeners some of the stuff that you're doing. Jonny Grave: First and foremost, I'm a musician. I'm a guitar player. I'm a singer, a song writer. I tour for that as well. I'm on the road a lot performing, but in addition to that, I'm also a photographer and a writer for a DC based online magazine and blog called Brightest Young Things. They tend to write a lot about new, current events, bars that are opening up, new restaurants, new things that are happening around town, and I write the history columns. I write about the old stuff, about the stuff that's not so contemporary, not so new. Brian: Got it. That's that music historian stuff you were talking about. Jonny Grave: Now, that's another side of the coin too. Because of the kind of stuff that I play, a lot of it comes from, called traditionals. They're not necessarily cover songs. I'm not playing a song the same way that let's say Robert Johnson or Muddy Waters would have recorded. I'm playing it in a new way, sort of carrying the song forward. A lot of that requires research. A lot of that requires digging into old recordings from the 1920s and 1930s, which is a lot of fun, but also takes a lot of work too. That's the musical historian side. I did some of that work with, I did a little bit of work with the Clara Barton sessions last year, a Civil War music project we did over at the Clara Barton Missing Soldiers office in Chinatown. Brian: Wow. I heard about the Clara Barton thing. Folks, if you're looking for that, if they want to find out about the Clara Barton thing specifically, is there somewhere online they can find that? Jonny Grave: They can go to clarabartonsessions.com. Brian: Clarabartonsessions.com. Check that one out. That was a really cool project that Jonny did here. Now, what about, so outside of the music thing now. Johnny on the personal side, where do we find Jonny? What does Jonny do? Jonny Grave: Probably find me at home with my dog. I had a really busy year in 2016. I traveled more in 2016 than I ever had in my whole life combined. Brian: Got it. The Coupe in Columbia Heights and if you're looking for a good coffee shop, check out The Coupe. Brian: That's right near Jonny. Working on different projects and the dog. Brian: Which the dog's name is? Jonny Grave: Stella is a dog. Brian: Got it and Stella, #stellaisadog? I think? Jonny Grave: My girlfriend made a hashtag. Yeah. The day we got her she said, "Are we going to create an Instagram account for the dog?" I said, "That's not an option. That is not, we're not going to do that." Brian: No social media profiles for the dog. Okay. Jonny Grave: No sorry. She is a dog. We compromised as intelligent partners are one to do in committed relationships. We compromised on a hashtag for the dog, so the hashtag is Stella is a dog, all one word. If you go look for that on Instagram, or on Twitter, you can find pictures of my mutt. Brian: Check out Stella online. I love it. Now, tell us about funniest moment that comes to mind. Jonny Grave: Funniest moment, on stage or with the dog? Brian: Let's go onstage. I'm sure Stella's got a lot of funny moments but talk about the performer side. Brian: This is how every good story starts Jonny. Jonny Grave: Yeah. Not to get sidetracked here but I don't believe that I'm getting old. I do think that I am getting older and think one of the joys of getting older is looking back fondly on the times at which you could have died and didn't. That's near brushes with death. Brian: They don't talk about that in the AARP material they send out but okay. Now, tell us one of these then? Jonny Grave: We're playing at the, this was May of 2011 and my band and I were playing at the Silver Spring Blues Festival, which was a big, outdoor concert. We were one of 10 or 12 bands that played throughout the day. We were somewhere in the middle of the day. It was a big crowd. It was a lot of fun. We're having a great time. We're on a stage that was elevated about maybe five feet off the ground. Not like a big, European festival kind of stage, but this is a reasonably sized regional concert. We're having a ball and somebody made the mistake of giving me a wireless guitar unit, so I'm flying around the stage. Brian: All over the place. Jonny Grave: I'm having a ball. It's great. I jump off the stage. I'm dancing in the audience. We're all having a great time. Then I get back on the stage and we're finishing up our last number. We got the two minute warning from one of the sound guys at the festival there. We're wrapping things up. We're trying to go for a big finish. I already jumped off the stage, so I figured I can't do that again. How do you top that? I figure, the best way to top that is to climb on top of the speaker stacks and do a Pete Townshend style split kick in mid air, which I did. I landed. It was great, but while I'm on this speaker stack, my heel slipped. I caught myself. It was fine, but then I suddenly realize I'm about maybe, the speaker stacks were about five feet off the ground. I'm already five feet off the ground with the stage. That's about 10 feet in the air, maybe 12 feet. I'm tottering back and forth. I can see my father in the crowd. It's 2011, so it was flip camcorder, and he's holding one of these things. He's holding it trained on me, but he's looking away for the entire time that I'm on the speakers as if to say, I can't watch this. This is terrible, but I really hope I'm getting it. Jonny Grave: I couldn't stop laughing. I found it just uncontrollably hilarious. Looking back on it, I easily could have slipped and cracked my skull. Brian: Oh Jonny you had me going there. There was no slipping. Brian: There was no falling. Brian: After that whole story? Oh my god you are such a tease. I love it. Holy smokes. All right. I was ready for the big climax, man. I love it. At the same time, 12 feet off the ground, no ripping pants. That's amazing. All right. Brian: Next time you see Jonny, make sure you ask him about pants ripping and some of the other fun stories as well, because he's got a lot from all of his time. That's for sure. What about biggest success moments? You've been at this for a while now. What comes to mind? Biggest success moment? Jonny Grave: There's too many to count. No I'm kidding. I think, one of my proudest moments was when my buddy Chris Naoum from Listen Local First, shoehorned me somehow into the Kennedy Center. This was after playing months and months at Madams Organ and Adams Morgan, which is a bar in sort of one of our big going out neighborhoods. If any listeners in Nashville, Tennessee, it's just like our Broadway. Any listeners in New Orleans, it's just like Bourbon Street. It's kind of touristy, but it's a happening neighborhood. We're playing there every week and this is after years of playing at rickety dives and awful bars and just walking out smelling terrible and just a lot of physically sticky situations. You walk out of that bar and you feel sticky. Not just Madams, there's a bunch of bars we played, but we got a call to play over at the Kennedy Center Millennium Stage and we played there in the afternoon. It was a spectacular show, and there was a show that we had to almost cancel at Glen Echo Park in Maryland. We were able to do a double header that day. We went from Kennedy Center to Glen Echo in about half an hour flat. We hauled it. It was fantastic. It was for a blues dance on this big bumper car pavilion. There's about 120 folks that were dancing. The thing at the Kennedy Center, they're all seated. They're sitting down. They're appreciative. They clap, but they're not really moving around a whole lot. We got to Glen Echo park, and it's like they're performing for us. That whole day was so much fun and I felt really proud. I felt proud that I was able to pull off a double header, to pull it off with a band that I worked hard with, to pull it off with songs and music that I wrote or that I care about very much. It was a really solid, good experience. I've played the Kennedy Center six times since then. Brian: Wow. Kennedy Center is one of those. I feel like people talk about some of the venues around DC like the 9:30 Club, as a status thing, if you've played 9:30. I also feel like Kennedy Center is up there for musicians. If you've played the Kennedy Center, it's a different caliber and a different feeling. Jonny Grave: It really is. That hallway there, here's your fun DC architecture, history fact. The grand hall of the Kennedy Center is so long that if you took the Washington Monument and laid it on it's side, you would still have room to spare inside the grand hall of the Kennedy Center. It's that deep. Hearing the snare on sound check was just, that was fun. Hearing the ricochet take five seconds to come back to you. Jonny Grave: One of the great things about that, not just the venue but particularly the Millennium Stage, which that opened in 2000, the staff at Millennium Stage has been putting on a free concert every night, 365 nights a year, putting on free music not just for locals but for out of towners. If you're in town, and you want to go see a show at the Kennedy Center for free, you can. They're hour long performances and they happen every night. It's a great mix of DC based national, international and a wide swath of genres. They're good folks. I really enjoy what they do. Brian: Now, one of the last things I love to ask in the interviews is, what's one piece of advice that you'd love to offer. Jonny Grave: Oh, don't give up. That's easy. If you've got an idea, polish the idea. Make sure that you've got a clear image of your idea, something that you can explain in about 30 seconds. Then, do it and don't stop doing it. Don't quit. Do not give up. Brian: What's that been for Jonny Grave? Jonny Grave: Just playing gigs. I record a lot. I don't sell that many. I don't sell a whole bunch. I sell some at shows and I sell some online, but for me, I play. I play gigs. I perform and I perform about maybe three to four times a week. I did a final count for 2016, I played 185 shows in 2016. Jonny Grave: That's more than every other night. I was very happy about that, but that's a lot of that was my own stubborn perseverance. Brian: Got it. To bring it to a close here, I know you said you had mentioned before the show, that there was something exciting you had coming up and then also, folks if they want to find out more about Jonny Grave, where do they go? Jonny Grave: Well, if you want to find out more about me, just go to jonnygrave.com. That's Jonny J-O-N-N-Y G-R-A-V-E .com. Johnny with an H, Johnny Grave is a guy in the Netherlands who sometimes answers my mistyped emails. There's a couple cool things that are coming up. I've got a winter off. I'm going to be in town until March. I'm going to hit the road again, head south in mid to late March, back through North Carolina, Virginia, Georgia, Alabama, Tennessee, Mississippi, but the fun gig in town, in Washington DC proper or sorry in Clarendon just up the road from the studio where we're sitting right now, has a great club called IOTA. They're doing another classic albums night. Jason Mendelson, a buddy of mine who's a multi-instrumentalists and a composer, great guy. He's putting together another classic albums show where he pics a year, and then he picks some DC based musicians and they play classic albums from that year live. There's going to be a great DC based band called Oh He Dead playing Abbey Road from the Beatles, Alex Vance and his band are playing Hot Rats from Frank Zappa, and my band Jonny Grave and the Tombstones are playing Led Zeppelin II from 1969. Brian: Wow. That sounds like a phenomenal night.